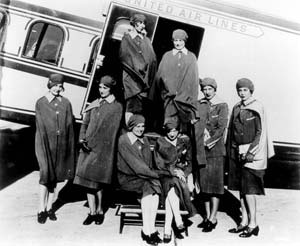 Among airline ‘firsts,’ United Airlines/Boeing Air Transport is credited with inventing a new concept of commercial air service in 1930: Hiring young women. Lesser known is that the first US airline to put male couriers on planes was another predecessor company, Stout Airways, in 1926. Registered Nurse Ellen Church and Boeing Traffic Manager, Steve A. Stimpson, a former steamship line agent, are affectionately regarded as”the Mother and Father of Onboard Service.” Ellen and the other seven nurses they both hired depended basically on skills acquired in three days, often less. of service, with safety always their primary role. There was a time long ago when airplanes had propellers and a “stewardess” who wore the wings of United Airlines cared for passengers. When these young women (no men on board then) got married, they had to give up both flying and their wings. So their wings were “clipped”. 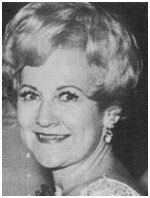 In 1941, former stewardess, Jackie Jos Ceaser, formed a club in Chicago to maintain her airline friendships and to help others less fortunate. In 1978, membership was extended to all online flight attendants. Today Clipped Wings is a national organization composed of 31 chapters across the country and open to all former, retired, and current United and Capital Airlines flight attendants. Clipped Wings has lost its most well-known member Vicy Morris Zelsdorf Young. She was the official historian and unofficial Spokesperson for many years and her name was probably known to every single member. We shall be forever indebted to Vicy for her dedication to Clipped Wings.